What better way to start off the new year than with some fresh news on rComplex? Well here it is! 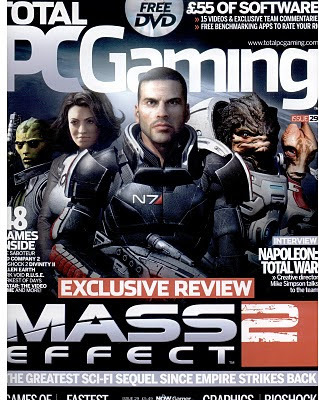 Issue 29 of Total PC Gaming Magazine includes a review of rComplex! rComplex is also included on the DVD that comes with the magazine. rComplex was given a score of 7/10 which isn't bad considering that they gave igneous a 8/10. I was happy to see that the actual written review was really positive. The reviewer really seemed to enjoy the visual style and audio in the game! What really surprised me was that the indie section on the DVD included Machinarium along side rComplex O_O! Not that I think rComplex isn't deserving but Machinarium is such a beautifully developed adventure game haha. It almost feels as if rComplex is out of place here but I'm honored to have it included regardless! 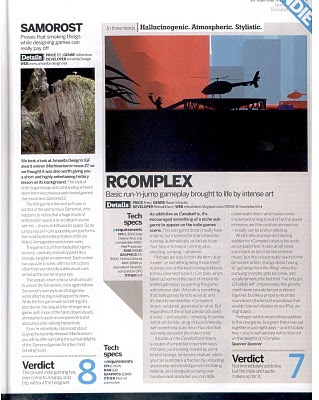 Either way I hope this gets more people playing rComplex and , hopefully, my other games as well. Speaking of other games, Brian Terwilliger (aka RawNuts) has posted some new renders on the www.wingsofapocalypse.com blog. Check em out! Hey, I don't know if you follow the podcast, but rcomplex kind of made an appearance on the january 22nd episode of 4 guys 1 up which you can get at 1up.com. They were describing your game but didn't remember the name of it. It sounded like they liked it. New site is solid. A debt of gratitude is in order for the colossal exertion. Click here to read more! New site is solid. A debt of gratitude is in order for the colossal exertion. Visit us to learn more! Many gamers also check the size and resolution of your laptop's display,superfighters unblocked the full 1080p High Resolution being your ultimate goal. Many also go with a Blu-Ray Drive if they can afford it. Why settle for anything but the best.